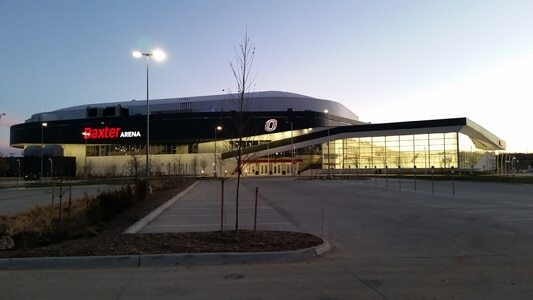 The University of Nebraska-Omaha’s (UNO) Division I hockey and basketball teams needed a new home. The growth of the university had required a split between its main campus and an expanded supplemental campus at Aksarben Village, an 80-acre, mixed-use development at the site of the former Aksarben horse-racing track. Officials began reviewing property around the development and soon identified the perfect spot for a new sports arena. The area just south of Aksarben Village, which was poised for redevelopment, was selected. Terracon had been heavily involved with the Aksarben Village in the past and had extensive information about the local soil conditions. Partering with both the developer and arena architect Terracon provided several services, including data mining, advanced drilling methods, characterization of the soils, and geotechnical engineering that helped reduce costs for the university and open the stadium in time for the new hockey season.. Designed with nearly 8,000 seats and more than 200,000 square feet of floor space, the arena contains two ice floors; one planned for the UNO Mavericks hockey team’s use with the seats as close to the ice as possible, with both a lower seating bowl and an upper seating level, and a second designed for community use. The project also included about 2,400 parking spaces, construction of several new public streets, and a bridge over the Little Papillion Creek. The project was located in the alluvial plain of the Little Papillion Creek which is characterized by about 50 feet of relatively soft clay over sand and glacial till. The creek had been straightened and channelized by the U.S. Army Corps of Engineers but at one time had meandered through the entire project site. Terracon had to address several geotechnical engineering challenges during the project partially based on the creek’s location. The alluvial clay soils had been shown to settle about 1 inch for every 1 foot of fill placed which, if not addressed prior to building construction, could lead to undesirable building settlement. In addition, the clay soils were not capable of supporting the building’s heavy column loads or the bridge piers. Construction of the arena parking lots, below-grade utilities, and the bridge over the creek also had to be coordinated with the Corps of Engineers which has jurisdiction over the Little Papillion Creek. Grading for the building included the placement of about 7 to 11 feet of fill, which translates to about 7 to 11 inches of potential building settlement! This was particularly challenging as the ice floors had a design requirement of no more than ¼ inch of differential settlement over a 50-year period. To address this issue and provide detailed subsurface information, Terracon completed a series of Cone Penetrometer Tests (CPT) using a fully enclosed, in-house rig. This advanced in-situ testing method provided more detailed characterization of subsurface conditions than conventional soil borings alone. The CPT data combined with a successful track record of using this testing method helped Terracon provide optimal foundation design recommendations while reducing the risk of undesirable settlement. Working with the architect and general contractor, Terracon recommended surcharging the building pad with up to 12 feet of fill to force the soil settlement to occur prior to building construction. The main building pad and community ice floor were surcharged for about 90 days, and the main ice floor for 180 days. To help achieve the client’s prerequisite of no more than ¼ inch of movement over 50 years. After identifying the poor near-surface soil conditions, Terracon also recommended that the building be supported on a deep foundation system consisting of auger-cast piles which extended to depths of about 90 feet below grade. When construction of the bridge over Little Papillion Creek began, a previously unknown historic slope failure became evident after repeated high-water flood events in the creek. Extensive subsurface exploration was performed using both conventional soil borings and CPT soundings. Terracon recommended and installed several piezometers and inclinometers and completed “high-end” laboratory testing. Terracon also recommended and then designed a slope retention system consisting of 22 helical tie-backs which extended up to about 100 feet into the slope. The retention system arrested the slope movement and helped protect the bridge structure from future slope movement. 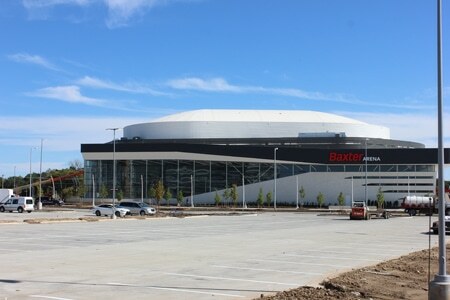 The Baxter Arena project was challenging but very rewarding. By working integrally with the design and construction team, Terracon was able to provide innovative engineering recommendations which allowed the arena to successfully open before the start of the 2015 hockey season.